Spike Lee will be wearing his exclusive "Knicks" colored Spiz'ikes when New York takes on Boston tonight. Spike Lee was a sneakerhead before sneakerheads were sneakerheads, and his late 80s Nike marketing campaign as Mars Blackmon alongside Michael "Money" Jordan is where it all started for a lot of us. Hybrid Jordan shoes haven't always been received well within the sneaker community, but the Jordan Brand's decision to pay tribute to Michael and Spike's relationship with the release of the Spiz'ike in 2006 has been one of the clear exceptions. Since then, the shoe has remained highly popular with Jordan collectors, and judging by a recent Twitter post from Spike Lee, he feels the same way. Earlier today, Spike took to his Twitter account to settle one of life's tougher questions - which "Knicks" exclusive colorway of the Spiz'ike should he wear to tonight's game between the New York Knicks and Boston Celtics. 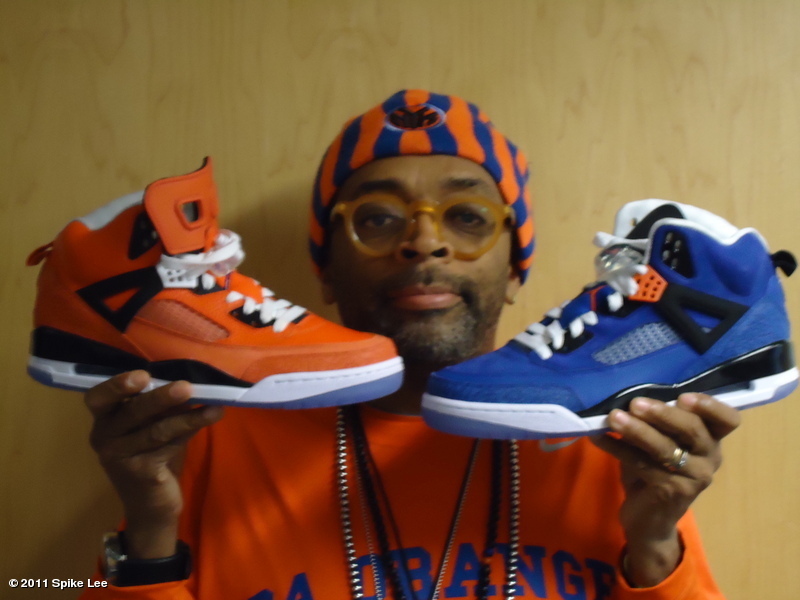 Along with his message, Spike included a picture of him holding up orange and blue-based pairs, which were specifically customized for him. Let us know which one you prefer and make sure you let Spike know on Twitter so we can see him rock them courtside tonight. Update: Spike will be wearing the orange colorway tonight, blue for Easter Sunday.